Besides the reputed and powerful Viking Axe, the Vikings often used the spears in their battles. It was not as beautiful and shining as the Viking Sword and it was not as fearsome as the Viking Axe. But when in the hand of a skilled Viking warrior, the Viking Spear could be the deadliest. The fact was that many Viking warriors chose spears as their weapons because it was cheap and easy to be made. Viking spear did not require much metal and nearly all blacksmiths of the Viking Age could create spears. One normal spear consisted of two main parts: the head and the shaft. These two parts were connected by a rivet. There were many variations in the designs and length of the Viking spears. The designs of the spearhead could vary and so could the length of the shafts. The first Viking spears could have a 20-centimeter head (8inch) while the later ones with around 60 centimeters (24inch). 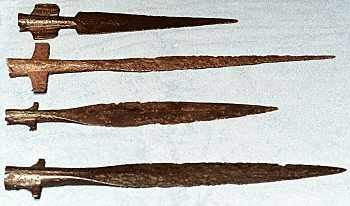 Some spears could have the “wings” and they were called the barbed spears. The materials to make a spear might be the iron, bronze, or wood. The shaft was often made of wood while the head was made of metal. There were some cases that the spear was totally made of wood, wooden head and wooden shaft. There were many creative ways to make use of the spear in the battles. And to the Viking warriors, there were three primary ways: throwing, thrusting, and cutting. The Vikings were famous for their practice of throwing the spear. This practice often happened when the battles just began. The Viking warriors and their leaders would throw their weapon into the lines of their foes to strike fear into their enemies and pick up their courage and warrior spirit. This practice was believed to originate from Odin the Allfather. As Odin often threw his spear Gungnir to start a battle, the Viking warriors followed this practice with a view to calling for Odin in their battles. More interestingly, the skilled Viking warriors could throw the spears with both of his hand at the same time. There were also the Viking warriors who could catch the enemies’ spears. Another way for the Vikings to use their spears was to thrust their spear into their enemies. They might hold their spears with one or two hands. When the warriors held the end of the spear, the spear could reach its full extent and hurt the enemies. 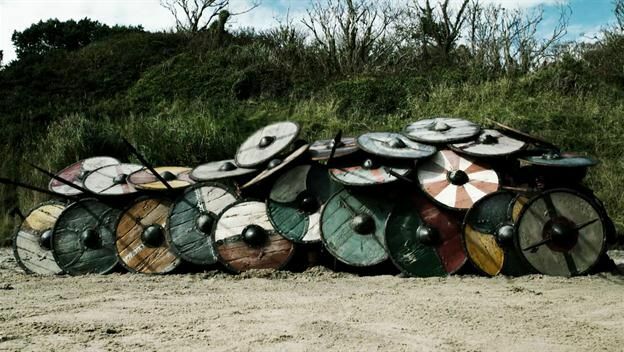 One of the most famous Viking warfare tactics was shield wall. Behind the strong wall of Viking shields, there would be many spears. The Viking warriors placed their spears over their front comrades (who were holding the shields) to thrust the enemies. Besides throwing and thrusting, the Viking warriors used their spears to cut their enemies. However, this practice was not so much common because the damage level of the spearhead was not great. But as mentioned, in the hand of a skilled Viking warrior, nothing was impossible, the spear could turn into a deadly cutting weapon which could rip their enemies to shreds. Though the Viking spears could be a deadly weapon, there were cases that spears were useless and make the Viking warriors stand less chance of surviving, not to mention winning. The shaft of the spear was made of wood and this material could be easily broken or cut by enemies’ sharp weapons. Thereby, when the warriors held the shafts to defend the slicing of the enemies’ swords, it was likely that the swords could easily slice through the wooden shaft and killed the warriors. Moreover, the practice of throwing spear might be cool but could not always secure the Viking warriors. Because as the warriors threw his spears, it meant he lost one of his weapon, not to mention the spear missed the target or the enemies could catch the spears and fling them back.